I've probably mentioned several times on this blog that we're rice-eating people. Occasionally, I break out of the norm with just potatoes and meat. This is more of a side dish. I needed something to pair with plain roasted chicken. The dish is simply flavoured but no less delicious with pork lard and dried spices to amp things up just a bit. 1) Mix all the above together (except the coriander). Bake until done. It took about 40minutes at 180C for me. Use a skewer to check. 2) Serve garnished with fresh coriander. 1) Steam the pumpkin until cooked. Spoon the flesh away from the skin and leave aside. 2) Blend the onion and garlic. Use a bit of water to get it going, if necessary. 3) Heat cooking oil in pan. Add the blended onion/garlic. Saute until just fragrant. 4) Add the spices and curry powder. Stir for a minute before adding the pumpkin in. 5) Then add ¼ cup water, pinch of chicken cube and salt to taste. Cook into a thick paste. 6) Switch the heat off, stir the coconut milk in. Let it cook for a bit before dishing out. 1) Potatoes, Chilli Flakes, Pork Lard. 2) Mix all the ingredients in 1) and bake! 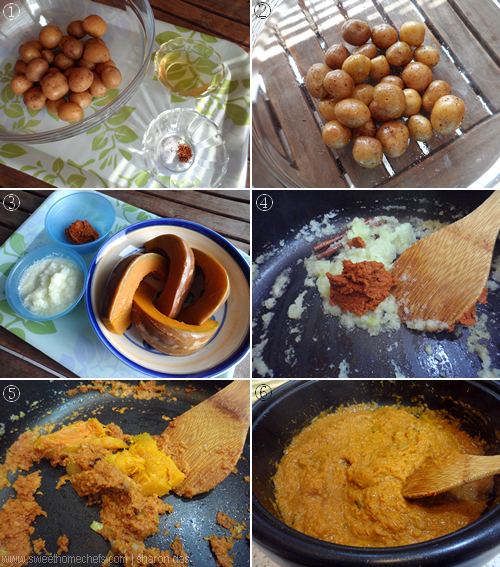 3) Steamed Pumpkin, Curry Paste and Blended Onion/Garlic. 4) Saute the onion/garlic, add the curry paste and spices. 6) Stir the coconut milk in last. Cook into a thick paste. Serve as a side dish with chicken, topped with roasted potatoes. There was way too much pumpkin for two people, so I had whatever was left over for breakfast the next morning. 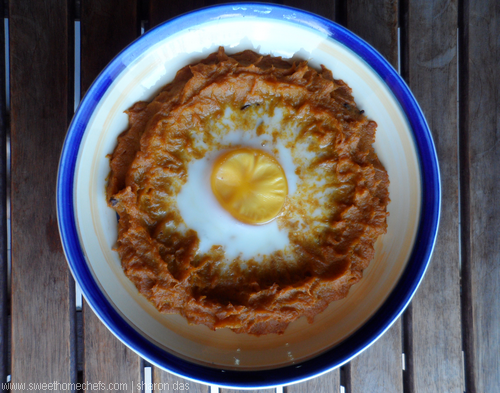 The basics -- spread the curried pumpkin onto an oven-proof plate, make a hole in the center and break an egg in. Then, bake until the egg is done. xoxo Shirley. Glad you like it! 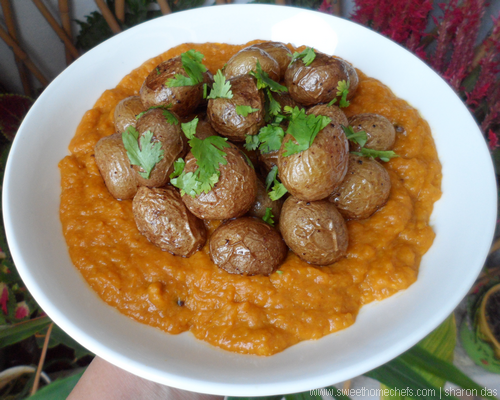 Awesome, I love everything - the roasted potatoes and the curried pumpkin with its spiciness. Would be good with some steamed rice. I love that curried pumpkin!!! 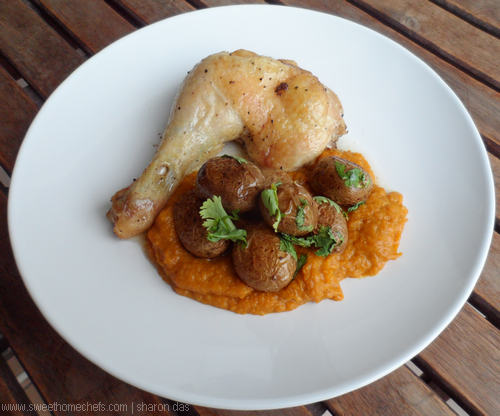 Roasted potatoes and chicken goes together well! High 5, Nammi! Me too! Wonderful combination! That's comfort food! And I love the way you used the leftover pumpkin. 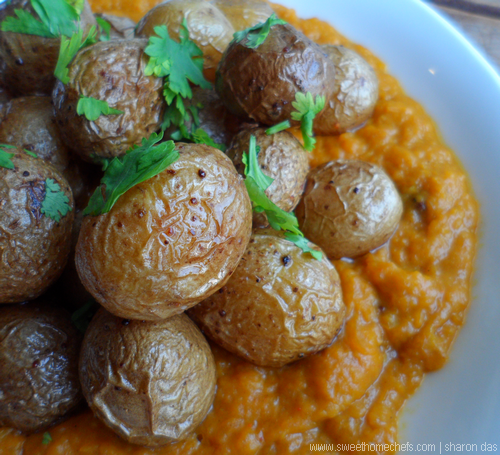 Roasted potatoes plus curried pumpkin is rather unique pairing but they surely look and taste yummilicious to me. Thanks for sharing Sharon !